Quote art might just be my favorite type of art. There’s something about having inspirational words and mantras right in front of you each day that helps me remember to stay on task or not to sweat the small stuff. 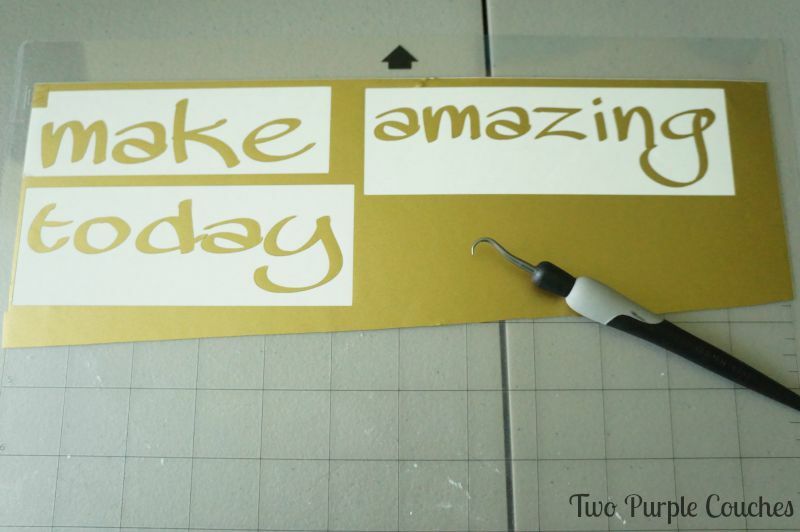 And the best party about making your own is that you can customize it with your favorite phrases and reminders! I love how this watercolor and vinyl quote art turned out, and I loved the process of making it. Watercolor has become my new favorite medium, thanks to a recent creative mini-retreat inspired by my friend Jennie’s new workbook. 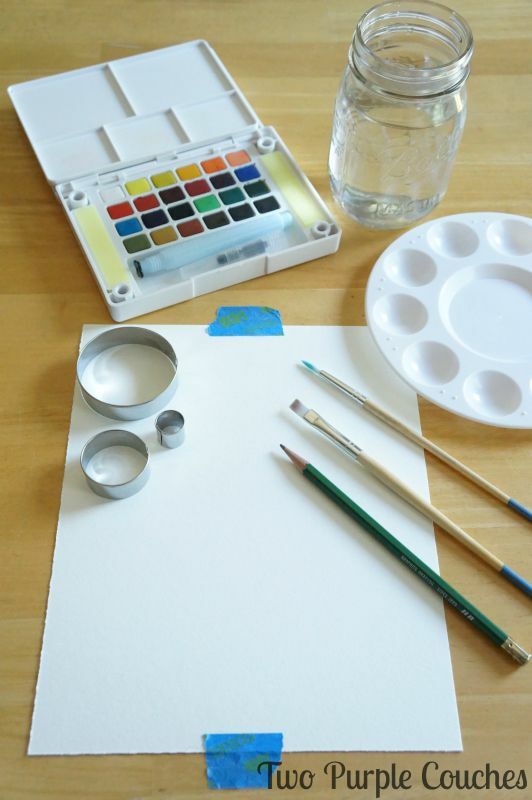 (I’m sharing the details about how I got started with watercoloring here). To make the watercolor circles print, I used 140lb watercolor paper (cut to fit my 8″x10″ frame), my set of Koi watercolor paints and round cookie/fondant cutters in various sizes. You could also freehand your circles, but I wanted mine to be crisp. 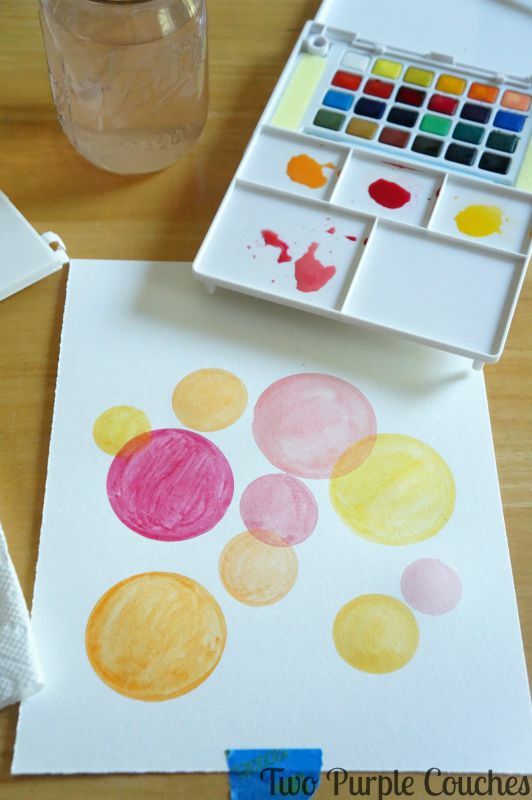 I didn’t trace the circles, but placed a cookie cutter on my paper, picked up some color with my brush and traced the circle directly with my brush. I stuck to the yellow-peach-orange-pink family of colors and mixed my own shades using the empty palettes. This gave me a much richer range of colors than just picking up exactly what comes in the paint palette. Plus I just like experimenting with different combos! When my page was filled with circles, I moved onto making my vinyl quote in Silhouette Studio. I knew I wanted a font with a hand-written look, and ended up selecting Mawns Handwriting (free for personal use) from dafont.com. I played around with the dimensions each word individually until I got them to the size I wanted, roughly 1.5″ tall and 4-5″ long. Then I tried something new to help with the cutting process – I drew “weeding boxes” around each of my words using the Rectangle tool. This made it a lot easier to weed out the negative space around my letters versus fighting with the whole section of vinyl on my mat. Okay, now back to the tutorial… Once the words were cut and weeded, I picked them up with a piece of transfer tape and positioned them on the middle of the glass for the frame. I found it helpful to place the watercolor print on a table, then the glass (sans frame) to get a good view at how this whole thing would come together. It may be easier to start with the middle word first, get that centered and then place the remaining words above and below it. I had every intention of doing this, but didn’t remember until I’d already placed “make” onto the glass. Oops! Oh well! It still worked out fine! I can’t help but drool a bit over those citrus-y colors. This is one of my favorite palettes, and this print will pair perfectly with my tangerine-and-magenta office! Oh, and guess what? Today is Silhouette Challenge Day for August! This month’s theme is Home Decor, which means there are a bunch more ideas coming your way! This entry was posted in Made It Myself on August 10, 2015 by Two Purple Couches. 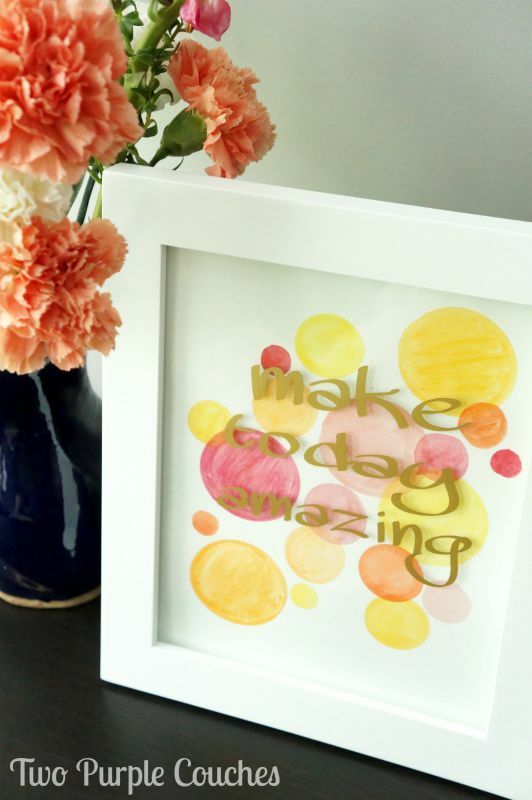 This project is so fun and bubbly– the juxtaposition of the circles and the text just makes me smile!! Great tutorial! I love how you have been experimenting with different techniques lately Emily! The combination of the vinyl and watercolors really works well together. I love the message too! Super cute. I love the bright colors you used. Emily, I so admire you for adventuring into watercolors! I’ve flirted with trying them, but haven’t taken the leap (I’m a little chicken…but also afraid they might take over my life! ;^). Love the watercolors and gold together, and how the overlapped parts add nuance to the color range. Nice! Aww, thanks Eff! I was hesitating trying watercolors for a long time because I didn’t think I’d be “good” at them. But then I decided, who cares, they look like fun! And they are! Which is kind of dangerous because now all I want to do is play with paints all day long, haha! Yes …[grin]… that’s what I”m afraid would happen to me too! LOL. 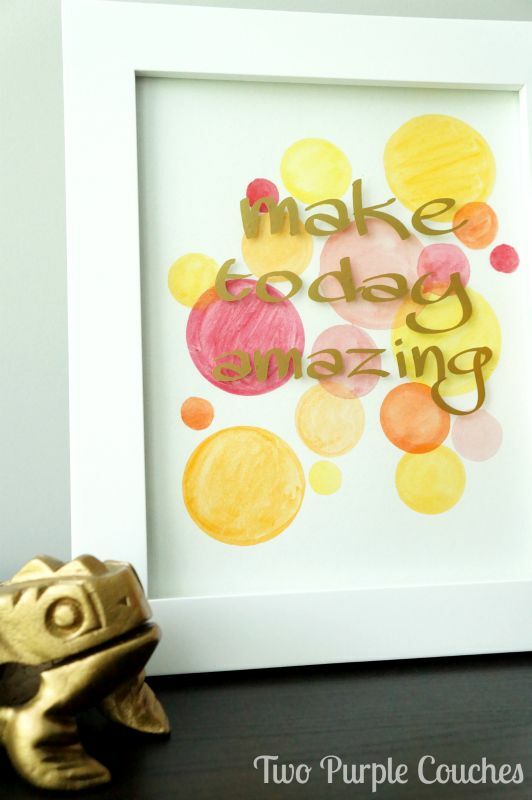 What a cheerful and lovely project! 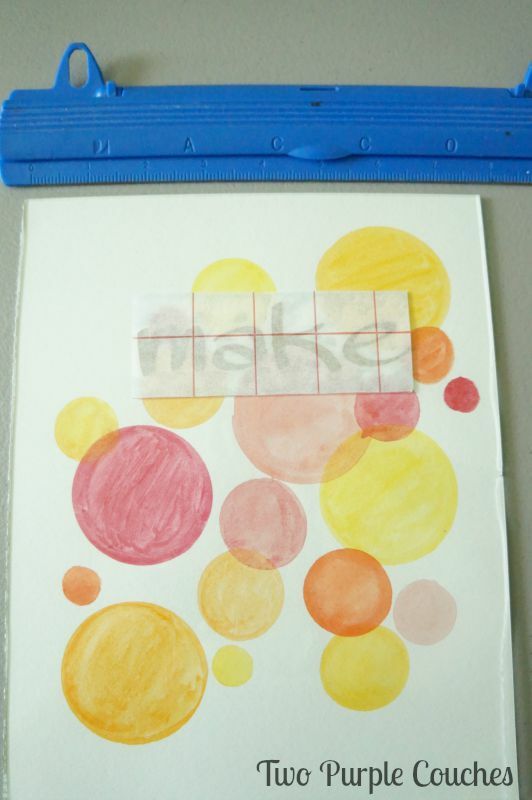 I love the idea of the watercolor backing. I get pretty intimidated by watercolors (or anything freehanded, for that matter) but I think some simple geometric shapes in a background would be a good place for me to start! And as far as the vinyl goes, are you talking about getting a “kiss cut” (where the vinyl is cut but the white backing isn’t?)? Or are you having problems with it not cutting all the way through the vinyl? The kiss cut is a good thing, if that’s what you’re getting! And I have started using weeding boxes for all my projects now, I agree, it makes it so much easier! This is so cute!! I love the colors you used especially. It must be so annoying that you can’t get a kiss cut!! Have you tried playing with the settings? Maybe try lowering the thickness. Every machine is different so you might have to play around with it? Also, what font did you use? Thanks for sharing!! Thanks Brittany! I just discovered what a kiss cut is, and I think my machine must be doing it right and I just didn’t know 😛 The font is called MAWNS Handwriting and I found it on dafont.com. Love the colors you decided to use here! Bright and summery but also perfect as we move into Fall. Emily this is awesome. I never would have thought to combine my love of watercolor with my love of silhouette. Great project! Pinning. I love how colorful and cheery this is! The 3D effect is really cool too, and your watercolor dots are so fun! 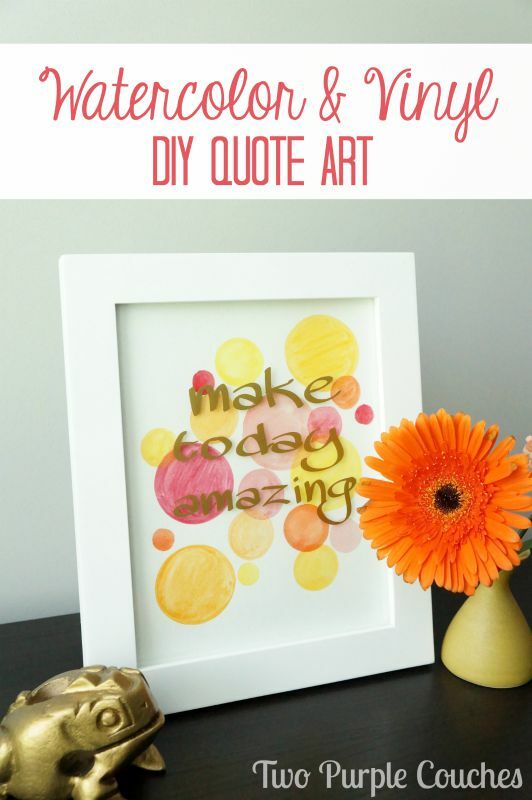 I agree…..quote art is one of my faves too! Christine | Where The Smiles Have Been recently posted…Personalized Lazy Susan IKEA Hack!